Note: Be careful when sharpening as the tools will become very sharp, always face the blade away from you when sharpening. Often the knifepoint of the blade breaks off quite soon in use, this is because they are used more heavily for woodworking. As they do wear away more quickly than if they were used for cutting fabric, sharpening becomes a necessary task. When the weak part of the blade, the very tip, snaps off, you are left with the stronger part, which is unlikely to break again and can be sharpened to give a more refined, stronger blade than the original. 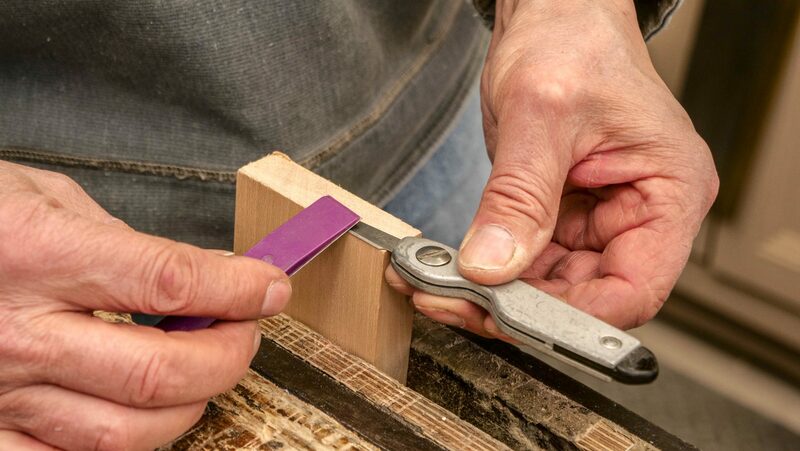 Use small paddles with different grits of abrasive paper on, or even a nail file as these have abrasive properties that can be used for sharpening. Place the knife horizontally on a flat piece of wood to raise it above the workbench. Take the most coarse surface and start to rub in a circular motion along the blade bevel. Do this same step using different grades of coarseness going from the coarsest to the finest. When one side has been sharpened, flip over and do the same to the other side. Tip: Take care when sharpening blades as these can go from blunt to sharp very quickly. The best way to test if the blade is sharp enough is to cut wood to feel how it is. Don’t touch the blade directly.